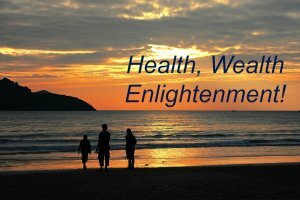 Where you will find info re health, wealth and enlightenment. I will also have a section for Masterkey Mastermind alliance and book/author blogs. It is hard to believe how much I have learned, experienced and accomplished over the last year on my journey to health and wealth. I am not just talking about money wealth. I am talking about the wealth of information I now have, plus the new roads my experiences are leading me down, toward further health and wealth. Also I am gathering great new friends along the way. I believe being grateful and helping others is the way to future health and wealth. I also hope to explore lots of new areas, such as ‘sound’ healing. As this is a new website, I think I will go back and begin where my journey began when I was a young girl. My health issues started as a child with asthma, bronchitis and sometimes pneumonia. Then my teens brought severe migraines, which kept me from doing and being everything I wanted to be. Then even more health issues followed. I would often pass out and had chronic urinary, yeast and sinus infections. My symptoms would go on to be semi-diagnosed as chronic fatigue and I had lupus type symptoms. And because of my migraines and aches and pains I would take too many narcotic pharmaceutical drugs to keep functioning. Then in 2007, like many others, I sat in front of the doctor for the ‘good news/bad news’ scenario you hear in movies. You hope it will never be you! “We think we can save your urethra, Mrs. McCracken, but the tumour is cancerous. Then in a daze you fall into line with mainstream treatments without even knowing there might be options. I had surgery and seven weeks of daily radiation with a short reprieve on weekends. I was now terribly burned and many of my internal organs were scarred and damaged. Luckily I had already raised two lovely boys. As they had informed me the treatment would also destroy my ovaries. But, I don’t write this as a sad blog. I write this as how my journey would intertwine between self-directed thinking, to milder alternative healing techniques and prevention. My illness also brought to fruition some of the goals I had always wanted to do! I would fulfil a childhood dream of writing a children’s book http://conniemccracken.com/book. Discovering better health, I could stop missing family events because I was sick in bed. I would be able to take trips again without getting sick I can now eat foods I was unable to without getting a migraine. Now my youngest son, calls me ‘the new and improved momma’ lol. I heard him the other day saying to his wife, “My mom isn’t sick like she use to be”. He remembered me as being sick and unable to do everything with the family when he was younger. So I hope you will follow me along some of the steps in my journey to see tips that can be helpful in your life and the lives of your loved ones. Learn how you can become more open-minded to new ways to health and wealth. Start to open your mind to new possibilities and ways to your bliss. If you ask for God’s/universal help and watch for the signs that can lead you to new people and circumstances in your life, you can decide your destiny! Remember, do and be who you are intended to be. Meet and learn from and help many others. I will write about the techniques and people that changed my life and I hope that I will help many along the way. your path in life to lead. Have you stopped and really thought about your health, wealth, enlightenment?? It is difficult to tell of your life and not think of it as being received negatively. I see this as inspiring because you have the courage to tell the truth, and you have survived some terrible health outcomes. This tells me that there are not just one way to be healed but several for us all. sorry about that I hit the wrong button and it kicked me out. Thanks always for commenting and supporting me. Yes, getting healthier is a combination of improvements in a person’s life. Plus being open-minded to taking our health into our own hands and seeing all of the great alternative ways to health. Also the support of good friends, such as you Even the small things can make a difference – like commenting on my blogs, makes me a happier – and smiling and laughing with friends is also great medicine!! I know that our team is going to help many and I so appreciate masterminding with you on ways to be more effective in spreading better health and wealth. I so like that our business helps people with their personal growth. It has been a very enlightening year! Let’s manifest an awesome 2017!!! Thanks for the Blog Momma! WOW! I knew you had some issues but realize how many. So grateful your here and helping me as well as others on their journey.